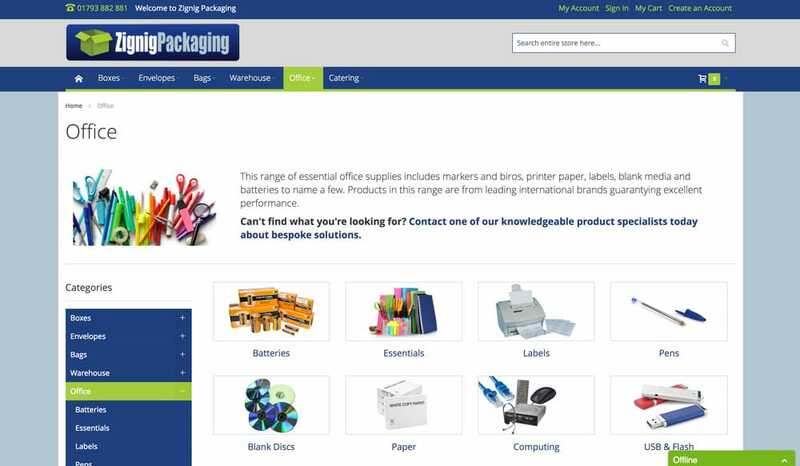 Zignig Packaging are a media and stationery retailer based in Barnsley, South Yorkshire. 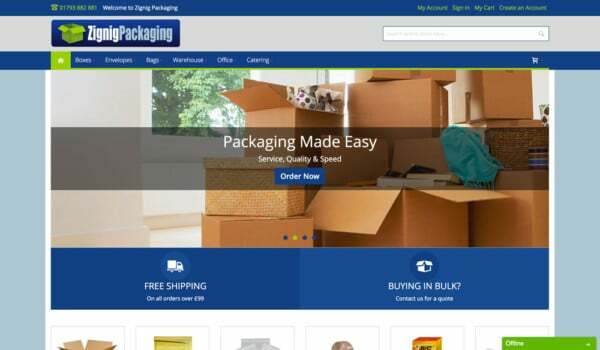 Zignig had been trading online for a number of years prior to calling Go Web, but their website had become a little outdated over the years. 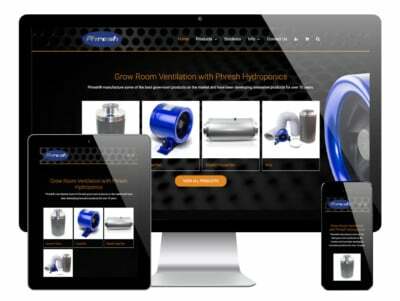 Once they called us to explain their needs, we met with the guys there and put together a proposal based on their requirements for a brand new ecommerce website. Magento (version 2, latest release) was chosen due to it’s flexibility and multi-store capability. 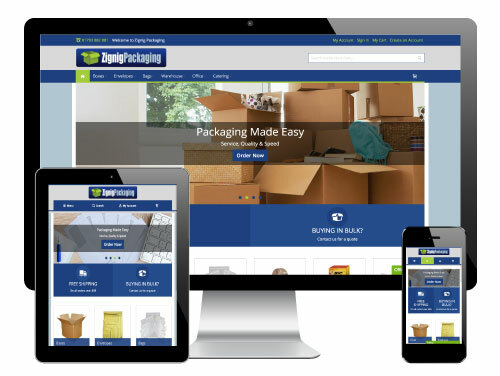 Zignig is part of a larger group including Riviera Multimedia, so it was important to future-proof this web solution and give it the ability to expand further down the line. 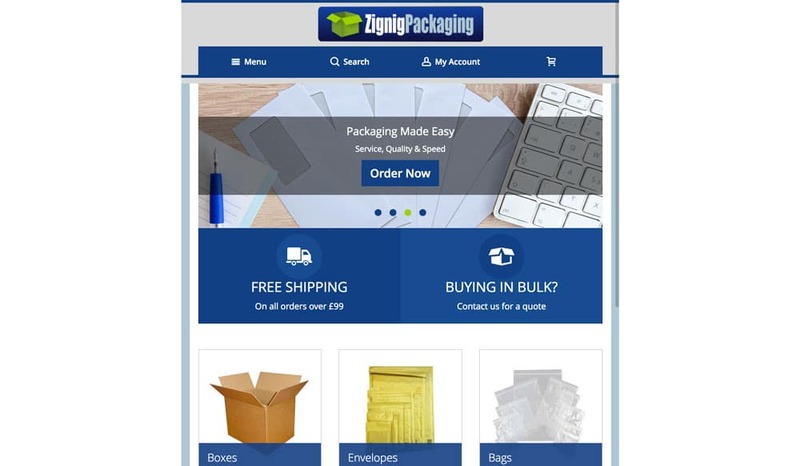 This Magento website was launched in July 2018, following six-months of design and development work to produce a site that is fast, attractive, feature-rich and user-friendly. 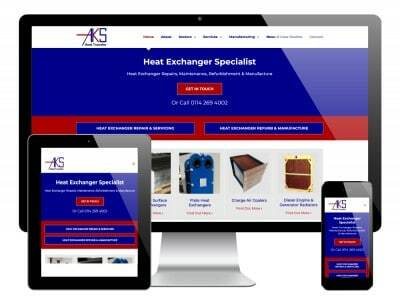 This Magento website was built using a fully responsive framework. 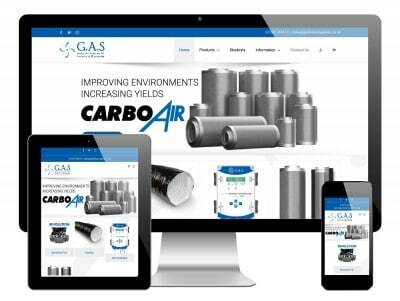 We used a combination of HTML and CSS, combined with a Bootstrap framework to create elements which work on any type of device or browser including a desktop, laptop, tablet or smartphone. On a full-sized desktop or laptop screen, the main menu appears full width as a ‘mega-menu’, which displays all categories in columns across the width of the page. On a tablet and mobile however, this layout intuitively changes based on the browser width, and instead becomes a classic dropdown type of menu. 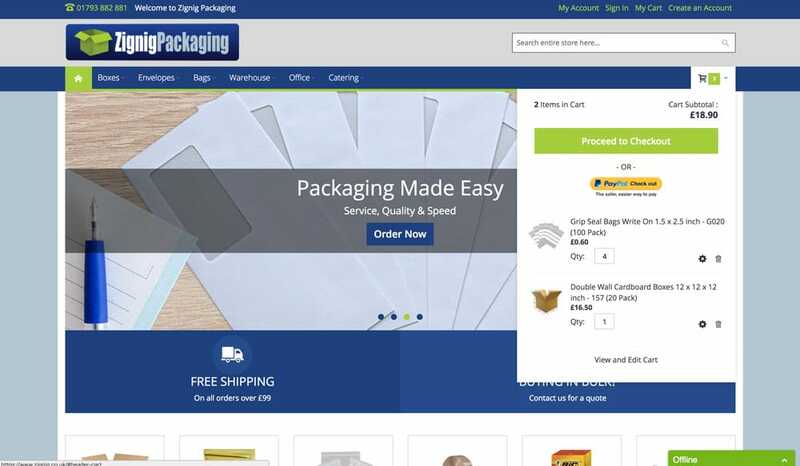 Other notable responsive elements include the product category ‘quick order’ tables, which again transition from a full-width table to more of a vertical list style, with separate ordering buttons. Based on the logo and colour palette provided, we created a design which not only looks neat and modern, but also draws the users eye to the more important elements. The design aims to draw the user into the shopping process immediately by highlighting elements such as ‘Add to Cart’ buttons in the bright green. 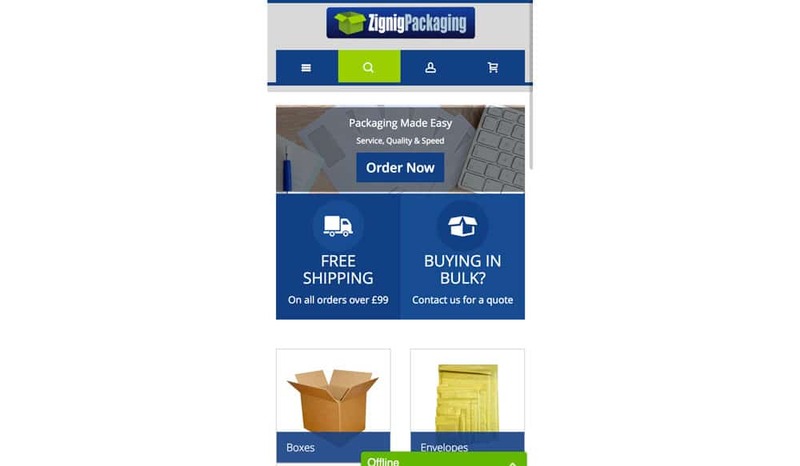 We also used a full-width image slider on the home page with automatic scrolling, once again to draw in and engage the user in the shopping process. Other design features of this Magento website include a native header, footer and sidebar (standard) along with useful elements such as a mega-menu and a dropdown ‘mini-cart’ which enables the user to quickly check their shopping basket before checkout. 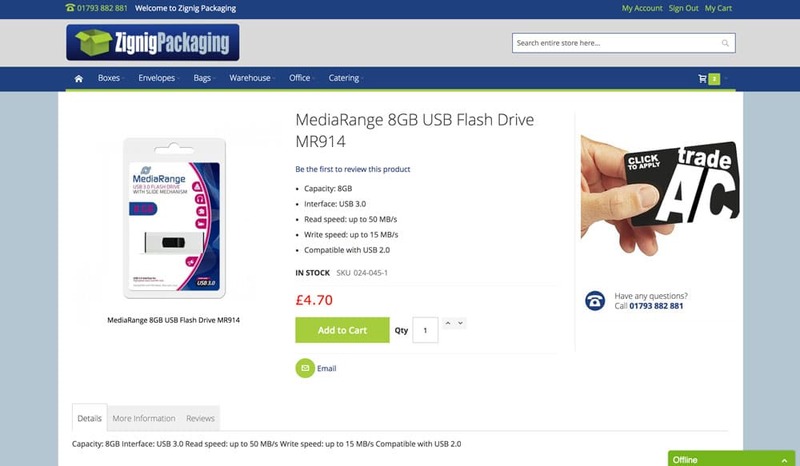 This site uses a combination of the generic Magento shop structure, coupled with a custom-created ‘quick order’ process (more about that later). The store offers a number of ways to navigate. The main menu is there as this is expected by the user. It is a full-width menu with dropdowns to categories. You then have a native sidebar which appears within category pages and automatically opens in the right place, based on where the user is. The site also features a layered navigation, where the user can click from a top-level category through subsequent sub-category thumbnails to reach their destination. 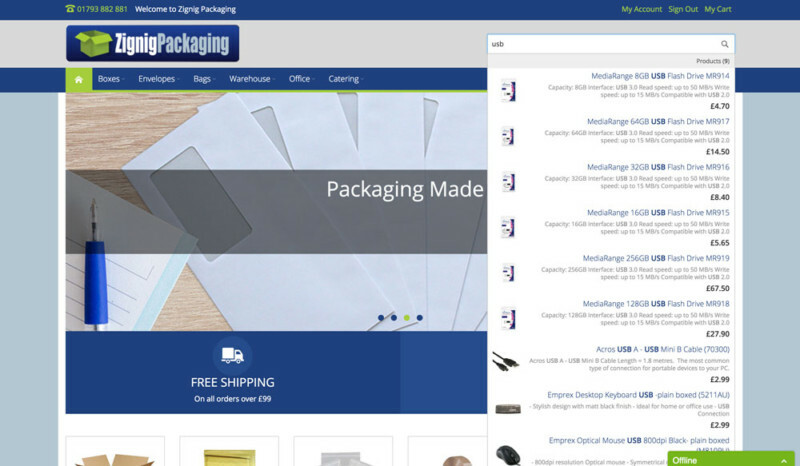 Other useful navigation features include related products, up-sells and cross-sells. These are also key to increase revenue and promote additional purchases. Importantly, there is also a quick-search function in the header, which allows the user to bypass all other navigation and simply find the product they want instantly using a free-type search. Not only does this present the user with a page of search results, but it also works quickly to identify what the user is looking for as they type, displaying a dropdown list of relevant products which can be clicked instantly without navigating away. 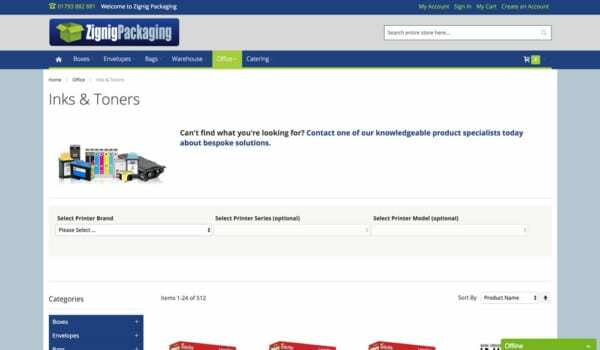 Using this function, the user only needs to type a minimum of three characters to be presented with a list of products featuring the keyword they are typing, saving an extra click and another page to visit. Due to the nature of the products offered by Zignig, they needed a solution which allowed customers to order items more quickly without having to navigate through multiple pages. For example, Zignig do a range of envelopes in different sizes. The average user tends to order multiple sizes in one transaction. 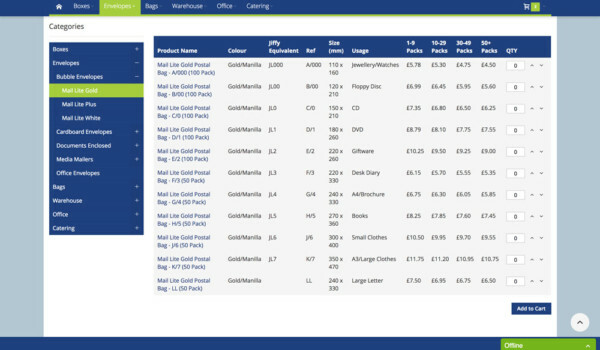 So, rather than ordering one size, then navigating to the next product page, we created product tables which allows the user to add multiple quantities or multiple sizes to their basket with the click of one button. This speeds up the order process and makes it much less frustrating for user to get what they need. We integrated this Magento website with multiple payment providers, including Sagepay and PayPal, to provide the user with many convenient ways to pay. 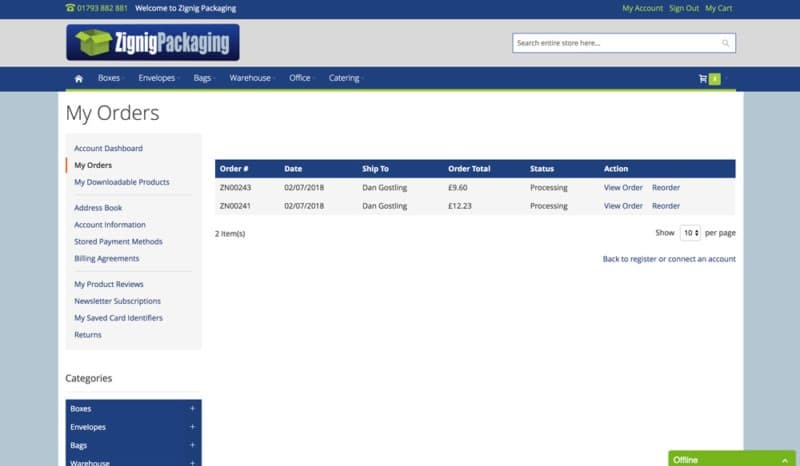 In addition to these, we gave Zignig the capability to allow ‘account’ customers to pay by invoice or cash on collection, to again give clients more flexibility. We also integrated with a number of worldwide couriers, meaning the user gets the best price and turnaround time based on the types of products they order. We made the checkout process as user-friendly as we could, starting with the mini-cart in the header (which appears on hover) through to the basket page and checkout area. 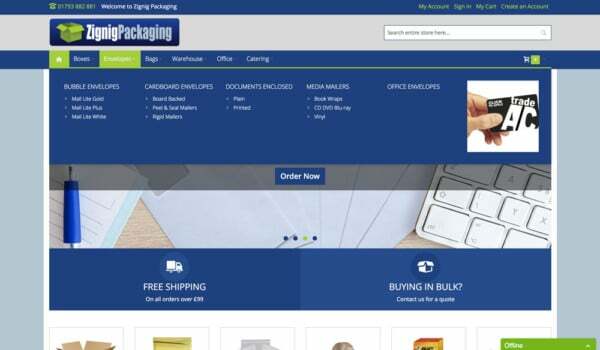 Magento websites are famed for their easy checkout process. A Magento website offers a huge amount of standard ‘back-office’ features for the user, which makes sales, products and customer management easy. 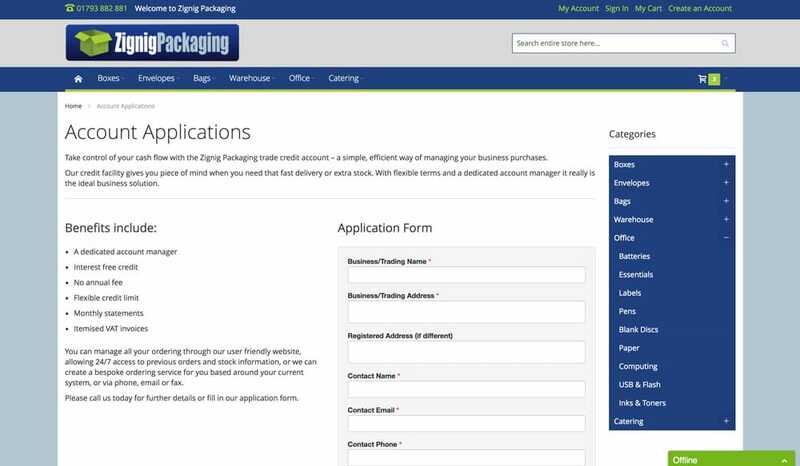 We enhanced this by providing bespoke ‘bulk’ management features to speed up processes for Zignig staff. From the customers point of view, the site features the full Magento account area, where customers can view and manage orders, addresses, repeat orders and subscriptions. To enhance usability for Zignig and their customers, we also integrated a returns extension to speed up that whole process.